Galician bagpiper, Anxo Lorenzo, has been awarded the Iron Eversteiner trophy at this year's Folkherbst's Festival in Plauen, Germany. Besides the award, Anxo Lorenzo and band get to return to Plauen to perform an additional concert in the new year. The trophy is awarded after voting by the enthusiastic festival audience on the ten different acts from all over the world who were performing, from traditional to avant-garde. The audience were completely overwhelmed by Anxo Lorenzo's brilliant performance, perfect technique on the gaita (bagpipes) and impressive command of the concert stage. 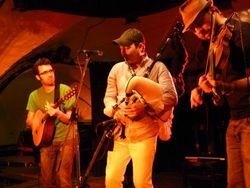 The Anxo Lorenzo Band, who are from Moaña in Galicia (North West Spain), will return to Plauen in January 2012 to accept the award and perform another high-octane live show. The last Galician band to win it was Berrogüetto who triumphed at the same event in 1998. The Anxo Lorenzo Band's last album was "Tirán" and they are part of Zouma Producciones.